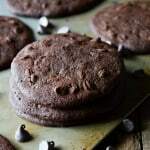 These Double Chocolate Chip Coconut Flour Cookies are grain-free and nut-free. Learn my secret trick for making coconut flour cookies crispy. Using a mixing machine, mix together coconut oil and coconut palm sugar. *You can cream it together and it will result in a lighter more cake like texture. Slowly add one egg at a time to the mixture. Add vanilla, coconut flour, cocoa powder and mix until incorporated. Add baking soda and salt and mix until incorporated. Lastly stir in chocolate chips. Line a baking sheet with parchment paper. Drop the cookies by spoonfuls onto the cookie sheet with at least 2 inches apart. *These cookies spread out very thin and almost double in size. I usually put 9 cookies on a tray in rows of 3. Let the cookies cool for a few minutes on the baking sheet before moving them to a wire rack to cool. Here is the trick to keep the cookie crispy because coconut flour based cookies tend to soften to the likeness of a pancake fast. Place the cooled cookies in the freezer. When you are ready to eat them pull one out and enjoy immediately. The frozen cookie will be crisp but not rock hard. *To get a crispy cookie you must either – freeze the cookie after it has cooled and keep it frozen or When you are placing the batter on the trays use only a tiny bit to make a mini cookie. Bake at the same temperature and for 12 minutes.